In an alternate Universe, Hit Girl and Hanna having grown up are backpacking across the world, enjoy the sights, sounds, leaving a wake of love struck europeans boys in their wake and fight crime. 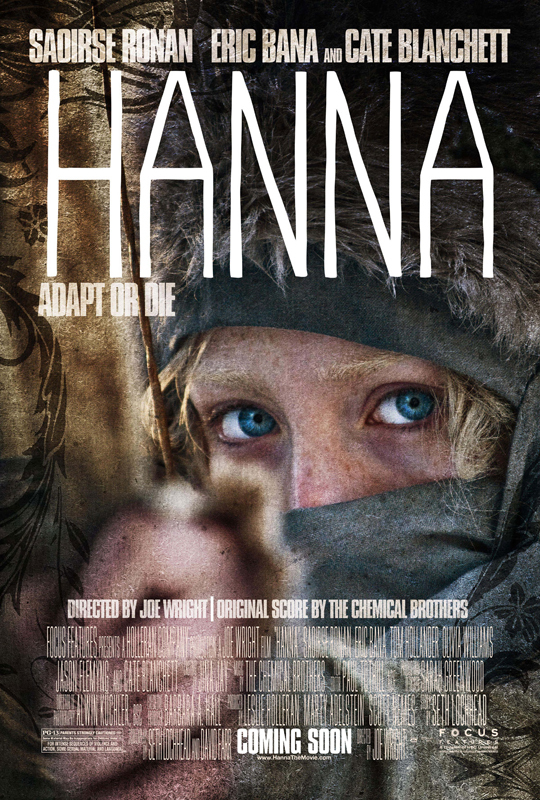 Hanna directed by Joe Wright is about Hanna played by Saoirse Runan has been living with her father, rogue CIA agent Erik Heller played by Eric Bana in the woods of Finland and has been home schooled in the classics like bow and arrow, knives and hand guns. Until one day she is ready to leave the cabin in the forest, venture out into the world and hunt down Erik’s old CIA handler Marissa Wiegler played by Cate Blanchette. Wiegler has risen through the ranks and wants Heller brought in immediately due to several skeletons that are rattling their way out of her thick wall safe. Hanna manages to elude her until Wiegler decides she must take matters into her own hands and calls up an old asset complete with his own neo-nazi thugs to hunt Hanna down and kill her. Along the way sheltered Hanna sees the world, meets boys, backpacks across Morocco with a lovely family all the while Erik leaves a swath of dead agents until he reaches Wiegler’s front door. There are several overlapping homages to fairy tales through out the movie that are handled quite well and Hanna’s backstory along with Erik’s and Marissa’s are dolled out piece by piece instead of a giant info dump (yes, I’m looking at you Salt) that would have thrown this movie off the tracks. I’m glad the movie was not rated R, the PG-13 violence is perfectly fine for this type of movie. In the post-Jason Bourne/MTV style editing this editing of this film is such a breath of fresh air. Lovely loooooooong cuts, good fight scenes even if on occasion they should have gone wide angle instead of medium close up and a great soundtrack by The Chemical Brothers. And, if Joe can handle this I’d throw his hat in the ring for any of the Bond films, the locations used was something of a breath of fresh air since America was nowhere in sight. The locales changing from snowy Finland to dry/hot Morroco desert to dark and gritty Germany. Overall, Hanna is well worth seeing in the theaters. Next → Next post: [Doctor Who] Preview Clips!